Sandane Airport, Anda (Norwegian: Sandane lufthavn, Anda; IATA: SDN, ICAO: ENSD) is a regional airport serving Sandane, Norway. It perpendicularly straddles the Anda peninsula in Gloppen between Nordfjorden and Gloppefjorden. The airport has an asphalt runway measuring 970 by 30 meters (3,182 by 98 ft) and aligned 08/26. Services are provided by Widerøe on public service obligation with the Ministry of Transport and Communications. The airport is owned and operated by the state-owned Avinor and served 37,272 passengers in 2013. The airport was opened on 1 July 1975 as the only public airport serving Nordfjord, four years after the other regional airports in Sogn og Fjordane. Originally the airport was served with de Havilland Canada Twin Otters. The airport was plagued with severe turbulence and low regularity. A terminal expansion took place in 1987 and the runway was slightly expanded in 2010. The first four airports in Sogn og Fjordane and southern Sunnmøre opened on 1 July 1971: Florø Airport: Førde Airport, Øyrane; Sogndal Airport, Haukåsen and Ørsta–Volda Airport, Hovden. This left the district of Nordfjord without an airport. Four locations were considered; in addition to Anda, these were Markane in Stryn, Bjørlomona in Eid and Mona in Sandane. Anda was ultimately selected. The airport opened on 1 July 1975. Services were part of the West Coast route operated by Widerøe with their 19-seat de Havilland Canada Twin Otters. Services were originally flown to Bergen Airport, Flesland; Ålesund Airport, Vigra and other regional airports on the coast. The airport initially had two man-years in the tower and two and a half for other operations. The airport had two employees on duty at any time: one in the tower and one which looked after operations and manned the fire and rescue service, as well as parts of the ground handling. The terminal building was minimal, and check-in was handled by a travel agency in Sandane. This changed in 1987 when the terminal building was rebuilt and the check-in moved to the airport. Widerøe replaced its Twin Otters with the de Havilland Canada Dash 8 in the early 1990s. 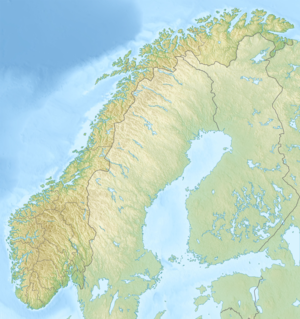 Ownership of the airport passed from Gloppen Municipality to the Civil Aviation Administration (later renamed Avinor) on 1 January 1997. Airport security was introduced on 1 January 2005. The airport was closed between 1 March and 26 August 2010 for renovations costing NOK 150 million. The main work was lengthening the runway by 160 meters (520 ft). The European route E39 is built in a tunnel under the extended runway. Sandane Airport is located at Anda in Gloppen, Norway. It is situated perpendicularly on a peninsula which cuts between Nordfjorden and Gloppefjorden. Both ends of the runway are close to sleep hillsides which dive into the fjords. Travel + Leisure included Sandane in its 2009 list of the world's seventeen scariest runways. The aerodrome has a reference elevation of 60 meters (196 ft). The asphalt runway measures 970 by 30 meters (3,182 by 98 ft) and is aligned 08/26. It has a takeoff run available (TORA) of 820 meters (2,690 ft) and a landing distance available (LDA) of 760 meters (2,490 ft). The airport is equipped with category 4 fire and rescue service. The airport is situated 10 kilometers (6.2 mi) from Sandane. Paid parking, taxis and car rental are available at the airport. Widerøe provides the only scheduled services at Sandane Airport. They are operated as public service obligation with the Ministry of Transport and Communications and are flown with Dash 8-100 aircraft. Services are provided to Oslo with intermediate stops in Sogndal. Operation of the airport runs at a deficit of NOK 20 million in 2012. In addition the routes are subsidies at a cost of NOK 1163 per passenger. Combined the air service received subsidies of NOK 1,476 per year. Sandane Airport served 37,272 passengers, 2,977 aircraft movements and 1.5 tonnes of cargo. The airport is located at the road E39. Taxis and rental cars are available. Sandane is located 10 km away. Nordfjordeid is located 12 km from the airport, but that includes a ferry connection. People in Nordfjordeid can also drive to Ørsta-Volda Airport, Hovden which from 2012 can be driven without using a ferry (78 km). Avinor is considering the regional airport structure in Southern Norway and has looked at the fate of Sandane airport. Of the five airports in the northwest, Sandane is by far the least used. Avinor has started a process to look at the airport structure in Sogn og Fjordane. After 2010, no new aircraft can be purchased except for small ones, which can use very short runways such as Sandane. Early plans have looked at closing down Førde Airport, Bringeland and Sandane Airport while expanding the runway at Florø Airport to 2,000 meters (6,600 ft). This would allow for jetliners to operate from Florø to Oslo with significantly lower ticket prices and remove the need for subsidies. Previously, the Ministry of Transport and Communications has proposed closing Sandane Airport and splitting the traffic between Førde and Ørsta-Volda Airport, Hovden. The road distance from Sandane to Førde-Bringeland is 97 kilometers (60 mi). People in Nordfjordeid and Stryn on the other side of Nordfjorden have been users of Sandane Airport. Road projects, such as the 2012 opening of the Kviv Tunnel has created one hour road distance without ferry for them to Hovden. Combined with the inability to extend the runway at Sandane further, this could cause the authorities to close down the airport. ^ "Lufthavnens historie" (in Norwegian). Avinor. Archived from the original on 3 October 2012. Retrieved 3 October 2012. ^ a b c "Sandane lufthamn". Fylkesleksikon (in Norwegian). Norwegian Broadcasting Corporation. Retrieved 12 January 2015. ^ a b c d Gynnild, Olav (2009). "Flyplassenes og flytrafikkens historie". Kulturminner på norske lufthavner – Landsverneplan for Avinor (in Norwegian). Avinor. Archived from the original on 25 January 2013. Retrieved 25 January 2012. ^ Olsen, Claude Roland; Ottesen, Gregers (19 February 1993). "Fred. Olsens milliardkupp". Dagens Næringsliv (in Norwegian). p. 5. ^ Rapp, Ole Magnus (27 July 1994). "Staten kjøper flyplasser på krita". Aftenposten (in Norwegian). p. 4. ^ Solberg, Pål E. (30 September 2004). "Tre usikre flyplasser i Midt-Norge". Adresseavisen (in Norwegian). p. 4. ^ "The World's Scariest Runways – Sandane". Travel + Leisure. Retrieved 12 January 2015. ^ "To and from the airport". Avinor. Retrieved 13 January 2015. ^ Riise, Ivar Lid (2 April 2013). "Kun 7 av 46 flyplasser gikk med overskudd i 2012" (in Norwegian). Norwegian Broadcasting Corporation. Retrieved 13 January 2015. ^ Bråthen, Svein (2012). Mulige endringer i lufthavnstrukturen – Samfunnsøkonomi og ruteopplegg (PDF) (in Norwegian). Møreforskning. p. 64–65. ISBN 978-82-7830-165-4. Archived from the original (PDF) on 3 October 2012. Retrieved 3 October 2012. ^ Oldeide, Erlend Blaalid; Grytli, Anna (26 March 2014). "Ny rapport: Ferjefri E39 kan utarme Sandane lufthamn" (in Norwegian). Norwegian Broadcasting Corporation. Retrieved 13 January 2015. Wikimedia Commons has media related to Sandane Airport, Anda. Larsen, Harald Thune; Bråthen, Svein; Eriksen, Knut Sandberg. Forslag til anbudsopplegg for regionale flyruter i Sør-Norge (PDF) (in Norwegian). Institute of Transport Economics. ISBN 978-82-480-1538-3. ISSN 0808-1190.